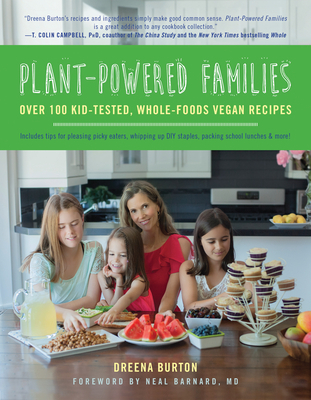 With tips for handling challenges that come with every age and stage--from toddler to teen years --Plant-Powered Families is a perfect reference for parents raising "weegans" or families looking to transition to a vegan diet. Burton shares advice and solutions from her own experience for everything from pleasing picky eaters and stocking a vegan pantry to packing school lunches and dealing with challenging social situations. Plant-Powered Families also includes nutritionist-approved references for dietary concerns that will ensure a smooth and successful transition for your own plant-powered family. Dreena Burton has been vegan for almost 20 years, in that time writing four bestselling cookbooks charting her journey as a plant-powered cook and at-home mother of three. Always passionate about creating nutritious recipes, she is an advocate of using the "vegan basics" to create healthy, delicious food for the whole family. Affectionately dubbed "Queen Bean" and "Vegan Cookie Queen" by her readers, Dreena is one of the pioneering vegan cookbook authors. Her cookbooks have garnered a loyal following, and Dreena has earned the respect and repute for reliable, wholesome recipes. After working in marketing management for several years with an international satellite communications company, Dreena followed her true passion of writing recipes and cookbooks. Dreena has appeared on television and radio and is a recipe contributor for well-known sites, including Forks Over Knives, KrisCarr.com, and PCRM. She has written for Yoga Journal, VegNews, ALIVE magazine, and has been featured in other publications including First for Women magazine. Dreena has won several blog awards including VegNews, VegBloggy, and Vancouver's Ultimate Mom Blog.